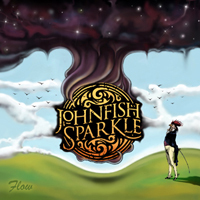 Italian power trio Johnfish Sparkle strikes back with their second effort - Flow. Ingredients are always the same; Bluesrock, classic riffs mixed with a modern taste to make the whole sound more attractive. You will not be disappointed by their excellent wall of sound! 10 tracks of pure Zeppelinesque/bluesrock energy! Maybe almost unique in their genre around Italy these days.